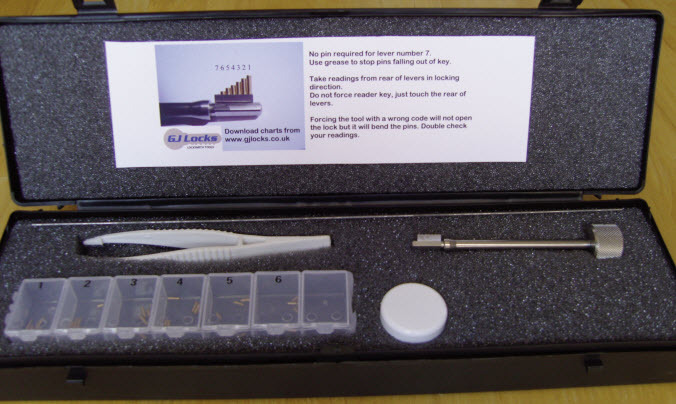 The decoder consists of a make up key, a set of pins a reader wire and a downloadable chart. First place the chart on the door so the key hole is lined up and the chart is square. 90 degree and 0 degree marks are there to make sure you don’t tilt the chart and miss read the lever. Use tape or bluetack to hold it in position. Insert a number 1 pin into the hole in the key that corresponds to the lever you wish to read. Also place the reader wire into the hole in the handle. 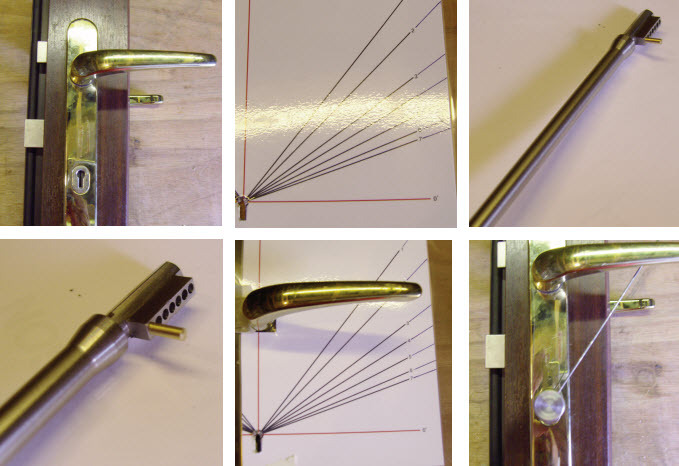 Place the key into the lock and turn in the locking direction and stop when the pin hits the back of the lever. No force is required and do not lift the lever, just touch it. Now read off the chart which lever it is. 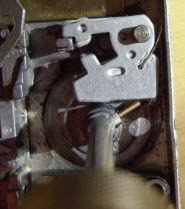 Now remove the key, and move the pin into the next hole which corresponds to the next lever you wish to read. Then insert the key back into the lock and repeat the process, taking a reading from each lever in the lock. When you have decoded the 5 levers you can build up the key with the matching pins. In this case the code was 12141. You could insert the rest of the pins to make a full key, in this case 1214121 then cut a key in your key machine for the customer if they didn’t want the whole gearbox changed. This tool is made here in the UK using quality materials on the latest CNC machines and if looked after will last a lifetime.